The Chief Justice of Ghana is the highest judge of the Supreme Court of Ghana. The Chief Justice is also the head of the Judiciary of Ghana and is responsible for its administration and supervision. In order of state precedence, the Chief Justice is the fourth highest official in Ghana. John Kofi Agyekum Kufuor is a Ghanaian politician who served as the President of Ghana from 7 January 2001 to 7 January 2009. He was also Chairperson of the African Union from 2007 to 2008. His victory over John Evans Atta Mills after the end of Jerry Rawlings' second term marked the first peaceful democratic transition of power in Ghana since independence in 1957. The New Patriotic Party (NPP) is a centre-right and liberal conservative party in Ghana. Since the democratization of Ghana in 1992, it has been one of the two dominant parties in Ghana politics; its leading rival being the centre-left National Democratic Congress (NDC). John Kufuor of the NPP was President of Ghana from 2001 to 2009. At the elections held on 7 December 2004, the party won 129 out of 230 seats. The NPP candidate was Kufuor, who was re-elected as President with 52.75% of the vote. The New Patriotic Party symbol is the African elephant and the New Patriotic Party colors are red, white, and blue. General elections were held in Ghana on 7 December 2004. The presidential elections resulted in a victory for incumbent John Kufuor of the New Patriotic Party (NPP). The parliamentary elections saw the NPP win 128 of the 230 seats. John Evans Fiifi Atta Mills was a Ghanaian politician and legal scholar who served as President of Ghana from 2009 to 2012. He was inaugurated on 7 January 2009, having defeated the ruling party candidate Nana Akufo-Addo in the 2008 election. Previously he was Vice-President from 1997 to 2001 under President Jerry Rawlings, and he stood unsuccessfully in the 2000 and 2004 presidential elections as the candidate of the National Democratic Congress (NDC). He is the first Ghanaian head of state to die in office. John Dramani Mahamapronunciation (help·info) is a Ghanaian politician who served as President of Ghana from 24 July 2012 to 7 January 2017. 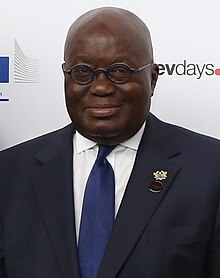 He previously served as Vice President of Ghana from 2009 to 2012, and took office as President on 24 July 2012 following the death of his predecessor, John Atta Mills. Mahama is a communication expert, historian, and writer. He was a Member of Parliament from 1997 to 2009 and Minister of Communications from 1998 to 2001. He is a member of the National Democratic Congress. Nana Addo Dankwa Akufo-Addo is currently the President of Ghana. He has been in office since January 2017. He previously served as Attorney General from 2001 to 2003 and as Minister for Foreign Affairs from 2003 to 2007 under the Kuffuor led administration. Ghana–Russia relations refers to the bilateral relationship between the two countries, Ghana and Russia. Russia has an embassy in Accra, and Ghana has an embassy in Moscow. Relations are still very friendly and close. Golden Jubilee House, or Jubilee House, is the presidential palace in Accra that serves as a residence and office to the President of Ghana. Jubilee House is built on the site of a building that was constructed and used for administrative purposes by the British Gold Coast Government. The previous seat of government of Ghana is Osu Castle. It was renamed Golden Jubilee House by President Nana Addo Danquah Akuffo Addo on 29th March 2018. It has previously been known as The Flagstaff House. The 2010 New Patriotic Party presidential primary election was a nationwide election organized by the Electoral Commission of Ghana at the request of the New Patriotic Party of Ghana for the election of a candidate that would represent the party in the 2012 presidential and parliamentary elections. It was held on 7 August 2010. The New Patriotic Party is the biggest opposition party in the Parliament of Ghana with 107 members of parliament out of 230. General elections were held in Ghana on Friday 7 December 2012 to elect a president and members of Parliament in 275 electoral constituencies. Owing to the breakdown of some biometric verification machines, some voters could not vote, and voting was extended to Saturday 8 December 2012. A run-off was scheduled for 28 December 2012 if no presidential candidate received an absolute majority of 50% plus one vote. Competing for presidency were incumbent president John Dramani Mahama of the National Democratic Congress (NDC), his main challenger Nana Akufo-Addo of the New Patriotic Party (NPP) and six other candidates. Joe Ghartey is a Ghanaian lawyer, academic and politician. He is the current Railways and Development minister. He was appointed by President Nana Akuffo Addo on 11 January 2017. Joe Ghartey hails from Shama, in the Western Region of the Republic of Ghana. Kwabena Agyei Agyapong is Ghanaian Civil Engineer, Politician and Sports Journalist. He is suspended general secretary of the New Patriotic Party. Kennedy Ohene Agyapong is a Ghanaian politician and businessman who represents Assin Central in parliament for the New Patriotic Party. He was first elected a member of parliament in 2000 to the seat of Assin North. He retained his seat in the 2004 and 2008 parliamenary elections. In 2012 he was elected in the new seat of Assin Central and was re-elected in 2016. Samuel Atta Akyea is a Ghanaian lawyer and politician. A member of the New Patriotic Party of Ghana, he is the Minister for Works and Housing, and the current Member of Parliament of Akim Abuakwa South constituency. He is only the second person apart from President Nana Akufo-Addo to have been elected as MP of that constituency in the 4th republic. Hassan Ahmed is a Ghanaian diplomat and a member of the New Patriotic Party of Ghana. He has served as Ghana's ambassador to several countries including Iran, Japan and Cuba. He was Head of Office of the UN-AU Hybrid office in Sudan. He is the current Director of Protocol for Nana Akufo-Addo, President of Ghana. Lord Oblitey Commey is a Ghanaian administrator, entrepreneur and politician. He is a member of the New Patriotic Party and the current Director of Operations at The Flagstaff House, the official residence and office of the President of Ghana. He has served as an executive member of Accra Hearts of Oak Sporting Club and is a former youth organizer for the New Patriotic Party. ↑ "Ghana Election: President admits defeat in poll". BBC. BBC News. 9 December 2016. Retrieved 9 December 2016. 1 2 3 4 5 6 7 8 The President – Chapter 008 – The Constitution of the Republic of Ghana 1992 – The Executive Archived 28 July 2013 at the Wayback Machine . judicial.gov.gh. Judiciary of Ghana . ↑ The Constitution of the Republic of Ghana 1992 – The Oath of Allegiance Archived 20 July 2011 at the Wayback Machine . judicial.gov.gh. Judiciary of Ghana . 1 2 "Profile: Ghana President John Atta Mills". BBC World News. 3 January 2009. ↑ "Ghana's President John Atta Mills dies". BBC World News. 24 July 2012. ↑ "Atta Mills dies". New York Times. Retrieved 11 April 2013. ↑ "Ghanaian President John Dramani Mahama sworn in". Sina Corp . 7 January 2013. 1 2 3 4 "Ghana unveils presidential palace". BBC News Online. 2008-11-10. Retrieved 7 June 2013. ↑ President Mahama Moves To The Flagstaff House Archived 8 May 2013 at the Stanford Web Archive . presidency.gov.gh. ↑ "Ghana gets a New Presidential Jet". adeparadio.com. Archived from the original on 24 June 2013. Retrieved 7 June 2013. ↑ GhanaWeb (9 December 2016). "EC declares Akufo-Addo president-elect". ghanaweb.com. Accra: Apex AdMedia. Retrieved 25 May 2018.